Yarn Along with Ginny today! Working on Elisabeth's sweater. I will make a Ravelry link for it later today, but right now I'm in a rush to get out the door. My husband's car broke down at work yesterday and I've been chauffering him so that I can have my car for the few things we need to get to. It's been hectic already and promises to continue to be so. He really needs a new car; our 13-year-old Outback has seen its best days come and go, by a long shot. I'm not sure what's going to happen with all that, but it's something we're going to need to address sooner than later. Reading the Smitten Kitchen cookbook! Love, love, love!!! 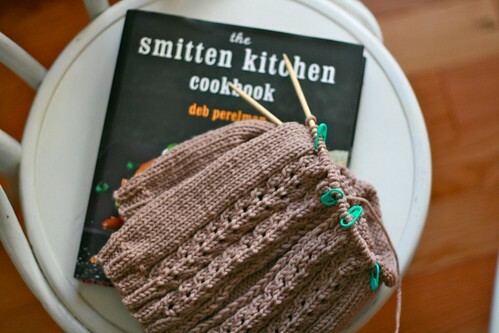 Smitten Kitchen is already my favorite cooking blog, and the cookbook is more of that goodness!